No more oily skin problems with the Lacto Calamine oil balance lotion! Lacto Calamine brings to you a clay-based lotion which provides Oil Balance for up-to 8-hrs through its unique 3-way action to give you a soft and supple skin every day. 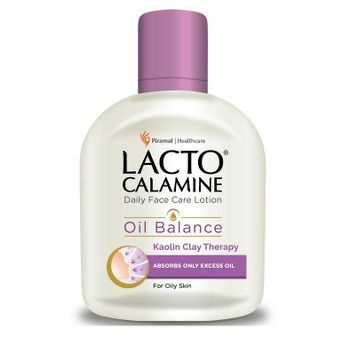 Lacto Calamine Oil Balance Lotion provides oil balance through its unique Kaolin Clay Therapy and 3-way action. Additional Information: Lacto Calamine is a famous skin care brand introduced by Piramal Healthcare. Being a trusted skincare brand for more than 30 years, Lacto Calamine is known for their Oil Control lotion that provides you up to 8 hours* of oil free skin. With its roots deeply ingrained in providing "Oil - free, problem free skin", the brand has always defied the stereotype of being obsessed with one's looks. Explore the entire range of Face Moisturizer & Day Cream available on Nykaa. Shop more Lacto Calamine products here.You can browse through the complete world of Lacto Calamine Face Moisturizer & Day Cream .Alternatively, you can also find many more products from the Lacto Calamine Oil Balance Lotion (For oily skin) range.